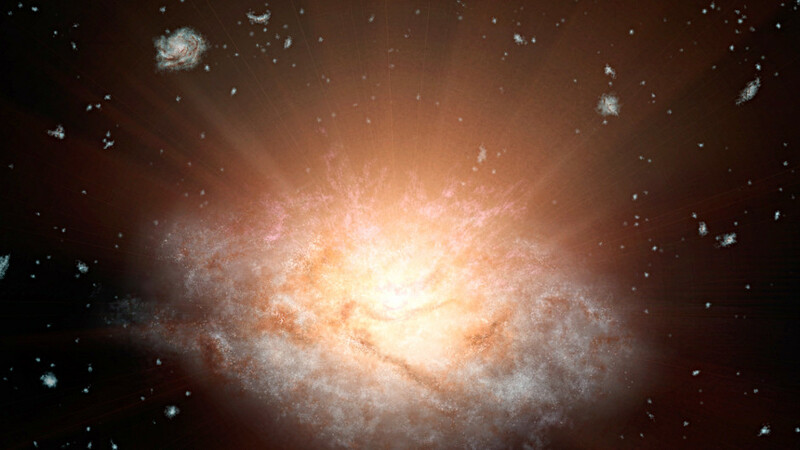 This artist’s concept depicts the current record holder for the most luminous galaxy in the universe. The galaxy, WISE J224607.57-052635.0, is erupting with light equal to more than 300 trillion suns and lies 12.5 billion light-years away. It belongs to a new class of objects recently discovered by NASA’s WISE mission — extremely luminous infrared galaxies, or ELIRGs. Image credit: NASA/JPL-Caltech. The brilliant galaxy, known as WISE J224607.57-052635.0, may have a behemoth black hole at its belly, gorging itself on gas. 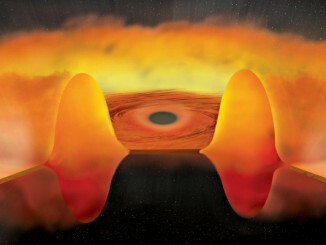 Supermassive black holes draw gas and matter into a disc around them, heating the disc to roaring temperatures of millions of degrees and blasting out high-energy, visible, ultraviolet and X-ray light. The light is blocked by surrounding cocoons of dust. As the dust heats up, it radiates infrared light. 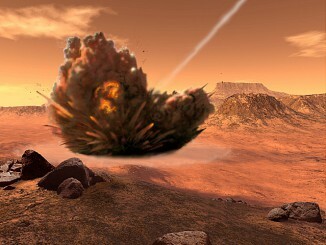 Much of the action on Mars occurred during a period known as the Late Heavy Bombardment about 3.9 billion years ago. 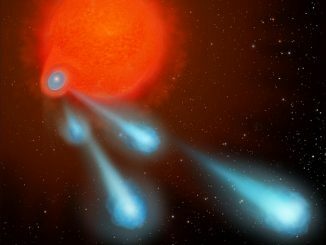 Large comets and asteroids raining down on the planet would have produced enough heat to melt subsurface ice, likely enhancing climate conditions enough to make Mars more conducive to life — at least for a time. A group of unusual giant black holes may be consuming excessive amounts of matter, according to a new study using NASA’s Chandra X-ray Observatory. This finding may help astronomers understand how the largest black holes were able to grow so rapidly in the early universe.